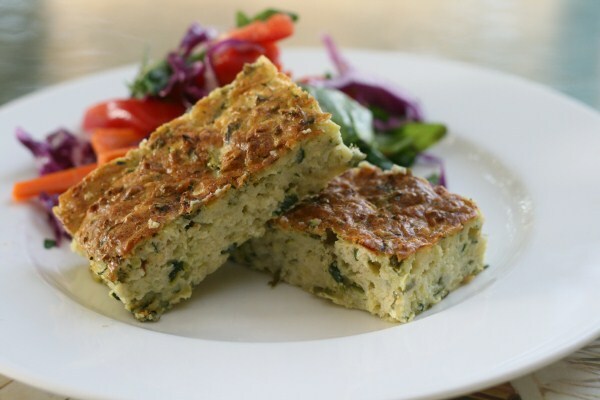 You havent tried zucchini slice until you have tried this one. There are a few Zucchini slice recipes kicking around. In Thermomix world, there is one in the Gluten Free cookbook and there are several on the Recipe Community. Most have onion and bacon in them. This is a vegetarian option and has lots of beautiful fresh herbs which really lift the flavour. The feta and Parmesan are also welcome additions. I have made this recipe plenty of times before I had a Thermomix in my kitchen and it would take me about fifteen minutes to grate the zucchini, parmessan and chop the herbs. Now its all done in seconds! The recipe comes from one of my favourite cookbooks; Belinda Jeffery’s Mix and Bake. Every recipe I have tried has turned out perfectly and she gives lots of helpful tidbits, which I love. This is a versatile recipe that I have served for lunch, dinner and even a girlfriend’s birthday brunch. In muffin form it goes into lunchboxes and tonight we had it for dinner tonight with a big garden salad. 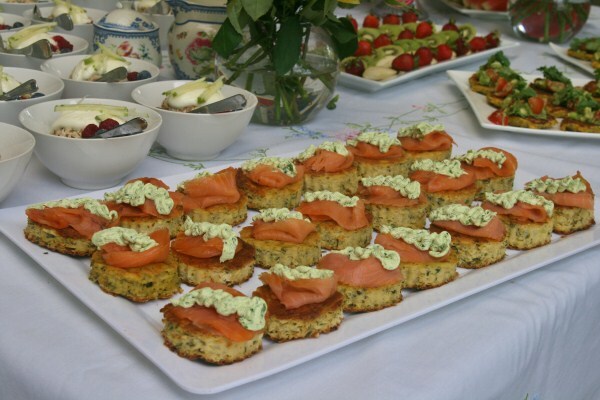 When I serve it for brunch or hors d’oeuvres I slice it into smaller sizes, or rounds and top with smoked salmon and Herb and Garlic dip (from the EDC). Preheat oven to 180’C. Line 22cm square tin with bakewell paper. Place zucchini in TM bowl and grate for 5 second on speed 6. Place into TM rice basket and put a plate on top to drain. Place Parmesan and herbs in TM bowl and chop for 5 seconds on speed 8. Add eggs and oil and mix 5 seconds on speed 7. Press down firmly on plate and squeeze out as much liquid as possible. Add zucchini to egg mixture, crumble in most of feta, season and add the flour. Mix for 20 seconds on Reverse + speed 4 or until combined. You don’t want the mix to be too processed and I often put my spatula in there to give it all a stir. Pour into prepared tin. Sprinkle feta over the top. Gently press the cherry tomatoes on the top. Bake 45-50 mins. (Make sure it is quite bouncy on top). Let set 10 mins and then cool on a wire rack.